The majority of the users praised the high-quality materials used in the Nike Air Max 90 Essential. Undeniably, this pair is a head turner, said many satisfied users. Great for running outdoors and doing errands, disclosed by a number of wearers. This pair carries an excellent shock absorbing capacity, said many runners. Longtime users revealed that this pair is very durable and reliable. Most thought that the Nike Air Max 90 Essential sneakers run true to size. The details and quality match the price point, admired by most testers. A real collectible item claimed by many buyers. Nike offers this in the market at an affordable price. This model is presented in multiple colorways. Some did not like that this pair needs a break in time. Most critics griped about the narrow fit of the Nike Air Max 90 Essential shoes. Some users did not enjoy its bulky profile. The colors of the items posted online are better than in the actual, complained by some buyers. Classic comfort in an iconic profile. Nike revolutionized athletic footwear forever by releasing the Nike Air Max 90 Essential. The chunky profile of this model highlights the Air-Sole unit in the heel which provides a bouncy shock absorbing feel and optimum comfort. This model has been praised by the majority of the reviewers for it was formed in a premium leather upper with Duramesh, a durable and lightweight foam midsole and presented in daring color selections. This kick is worth adding to one’s collection despite the reported inconsistencies in width. In the late 1970s, Nike introduced the Air-Sole unit to the market. The Nike Air Max 1 was the first shoe released in the market with a visible Air-Sole unit in its heel. The succeeding generations of the Air Max shoes were released in various noticeable color combinations making it an instant hit with athletes and collectors. In 1990, the Nike Air Max 90 was released as Nike Air Max line's second flagship model. It was the brainchild by the legendary Tinker Hatfield as the third installment in the Air Max line and was originally named as the Air Max III. It became famous for its outstanding comfort. The original Air Max 90 was conceived displaying an overlapping Duramesh, synthetic suede and synthetic leather. 27 years after it was launched, the Nike Air Max 90 shoes were able to maintain its status as the most popular shoe with countless collaborations and hybrids. The Infrared model is still considered the greatest sneaker of all time by most Air Max fanatics. The Air Max 90 Essential was released in 2016 as the rework of the original Air Max 90. It uses better and lighter materials. Overall, it seems almost the same copy of the original version, but Nike ditched the suede on the upper and the Air-Sole unit used is smaller and compressed. The Nike Air Max 90 Essential running shoes feature a unit of Air-Sole in the heel that can be seen through the cutout. Nike wanted the wearers not only feel the air cushioning but also to see it. This feature proved that the prototype Nike Air Max was able to stand the test of time as being one of the most loved classic silhouettes. It found its path from being a simple running shoe to being a streetwear shoe. Highlighting the superb cushioning and timeless profile, this delivers comfort and support fitting for all day walking. Going casual with the Nike Air Max 90 Essential is easy by wearing it with shorts, tees, and sunnies. Street swaggers cruising with their AM 90 Essential will surely get the people’s attention with this chunky casual, running sneaker. Included in the Suede Pack, this all black sneaker features all-suede upper contrasted with a white Swoosh logo and a thick white midsole. The color-blocking style retained the simplicity and the classic vibe of the Essential series. Sold for $110, this model combined the Wolf Grey, Anthracite, and the White hues to come up with a perfect colorway that gives an authentic retro vibe. This shoe provides a beautiful focal point to one's casual attire without going overboard. This all-white kick displays a clean and crisp vibe that can be paired up with any attire. The all-white hue boasts its versatility and timelessness that can be worn whatever generation you are in. Another eye-catching colorway of the Nike AM 90 Essential was unveiled using hints of the favorite Jordan 1 'Bred.' The mesh upper has a back black leather added with the plush suede overlays, contrasted with the white midsole. The Light Bone mesh upper is accented with black and white elements all over to give a nice combination of colors. To make this kick more interesting, the brand added Sport Turquoise on the Swoosh logo, Air-Sole unit, and on the lining of the collar. Nike came up another strong combination of hues to revamp the classic AM 90. The mesh upper is in white accented with dark grey elements. The mudguard, meanwhile, was dressed in a vibrant red hue which serves as the domineering point in the entire sneaker. This model showcased a University Gold base added with brown leather mudguard and highlighted with pink and blue details. The combination of suede, tumbled leather and mesh gives this model a hint of luxurious touch boosted with the plush combination of hues. The blue tone upper resting on top of white midsole gives contrasting appeal to this lifestyle sneaker. The Nike Air Max 90 Essential has a padded collar and lining to provide comfort for the wearers. It has a massive amount of cushioning in the PU midsole that is working together to deliver a plush air ride to its wearers. This shoe has the conventional lace-up closure system for a personalized, secure fit. The Air Max 90 Essential runs true to size. 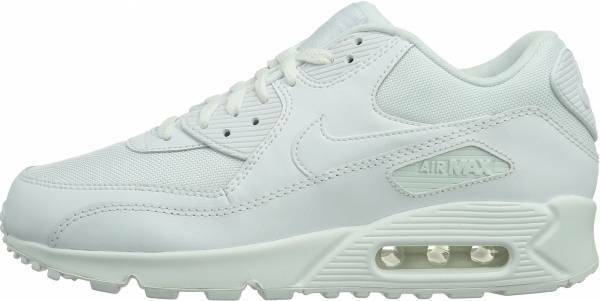 The Nike Air Max 90 Essential men’s sneakers are offered from sizes 6 to 15 US in medium width. Ladies who are in search of Nike Air Max 90 Essential sneakers in women’s sizing need not fret. They are advised to purchase a full or 1.5 sizes down than their regular size for comfortable strides. One would surely not miss the air bubbles located in the heel of this pair. The men’s Air Max 90 Essential running-inspired shoes display the Air-Sole unit in the heel area which provides support and bounces back giving much better energy return to its wearers. Compared to its sister vintage silhouettes, Nike used smaller air units in the 90 Essential models. In addition, the classic Nike Air logo found on the heel is something quite noticeable. It is a design typically seen in the 90s, and Nike revived it through the Air Max line. The Nike Air Max Essential 90 Essential was molded with a premium leather upper with mesh overlays for comfort and durability. The heavy-duty foam midsole with Air-Sole unit in the heel provides maximum protection from impact. The Air-Sole unit present in the 90 Essential is smaller compared to classic versions. The outsole is made of rubber with waffle pattern for better ground grip and durability. Presence of padded collar and the inner lining for extra comfort. It has the Air Max tab on the lateral and medial side of the shoe. The huge Nike logo is located on the heel tab. This element is usual for vintage shoes and something that is not common for modern shoes. The Nike Air Max 90 Essential is available in the NikeiD technology where one can personalize his/her pair, from the materials in the upper to the colors and prints.